The remarkable properties of two-dimensional systems (graphene, MoS2) have lead to numerous attempts aiming at synthesizing similar systems based on silicon, the key material of microelectronics. Unfortunately, it is impossible to exfoliate bulk silicon because of its diamond-like structure. However, the growth of a silicon layer over a silver substrate seemed a promising track because these two elements are immiscible. Some even announced the realization of transistors. But things are a little bit more complicated. Researchers of the INSP and IMPMC have shown that interaction between Si and Ag is far from negligible and that during the deposition, Si atoms insert in the surface layer of the substrate during the formation of the “silicene” layer. Silicene is an equivalent of graphene for silicon, which means a layer of silicon atoms organized in a honeycomb lattice. Since ab initio calculations predicted its existence, and electronic properties similar to the ones of graphene, many experimental studies have been performed in order to synthesize this system. 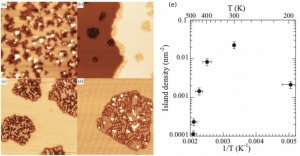 Two-dimensional crystalline layers have been obtained, especially on Ag(110) and Ag(111) substrates, but their nature (Si only or Si-Ag alloy) and their structure are still in debate. In a previous work, we demonstrated that an important surface reconstruction of the substrate occurs during the deposition of Si on Ag(110) and Ag(111), leading to the release of Ag atoms. This result questions the idea of a purely silicon layer weakly interacting with the substrate. 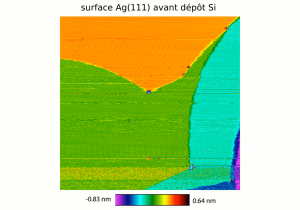 In order to get a better understanding of the growth mechanism of the Si/Ag(111) system, we used in situ Scanning Tunneling Microscopy (STM) to follow the evolution during Si deposition at various temperatures between 200 K and 500 K.
(a-d) STM images (43x43 nm2) of Si islands obtained at different temperatures : (a) 300 K, (b) 400 K, (c) 440 K and (d) 480 K. (e) Evolution of island density as a function of temperature. These observations demonstrated the existence of two different growth modes, depending on the substrate temperature. At 500 K, one first observes the diffusion and anchoring of Si atoms on the step edges, and then the growth of 2D islands (Fig. 1). These islands present the 4x4 and √13x√13-R13.9° crystalline structures usually assigned to silicene. The most striking feature of the growth process at this temperature is the appearance of new Ag terraces (Fig. 2). This phenomenon proves that the formation of the islands go with the release of atoms from the substrate, which means that Si atoms are inserted in the surface layer of the substrate. At 300 K, this insertion of Si atoms still exists but the islands are smaller and less organized. At 200 K, Si insertion is blocked and the observed islands, most likely composed only of Si, are amorphous. Sequence of STM images recorded during the growth of a silicene layer on Ag(111) at 450 K.One can see first the nucleation and growth of islands, and then the sudden appearance of new Ag terraces which grow from the step edges and spread between the islands on the lower terrace. The evolution of the island density as a function of the temperature (Fig 2.e) reveals the competition between two growth modes : at low temperature, island growth results from diffusion of Si atoms above the Ag surface and nucleation of Si dimers, whereas at high temperature, Si atoms insert in the first layer of the substrate before diffusing and participating to island growth. The maximum of island density, observed at room temperature, corresponds to the situation where Si atoms are inserted but immobile after this insertion. This process of Si insertion has been confirmed by DFT calculations showing that it is energetically favorable. These observations allowed us to determine the growth mechanism of the Si/Ag(111) system. In particular, they have shown the importance of the Si insertion process. The next step will be to determine precisely the atomic structure of this system from X-ray diffraction measurements. It will be important to consider the modification of the substrate induced by the growth mode and the possible participation of Ag atoms to the observed structures in order to analyze correctly the diffraction data. In parallel, we want to study the growth of silicon (silicene ?) layers on other substrates on which the Si-substrate interaction should be weaker.